Inspired by the popular 3281 model, this contemporary with 9 ft ceilings throughout is even roomier with 2 additional feet of depth to create a home that measures 38’ wide x 50’ deep with a 14’ x 21’ garage that has its own mezzanine. The increase in size permits several changes that include a conveniently located washer/dryer on the main floor and a large, walk-in pantry with an even bigger kitchen island. The main activities area is well placed with its rear orientation and has a wonderful view of the back yard. There is a walk-in closet that has been added to the master bedroom, a feature which is more and more in demand and is sure to be appreciated by the occupants. 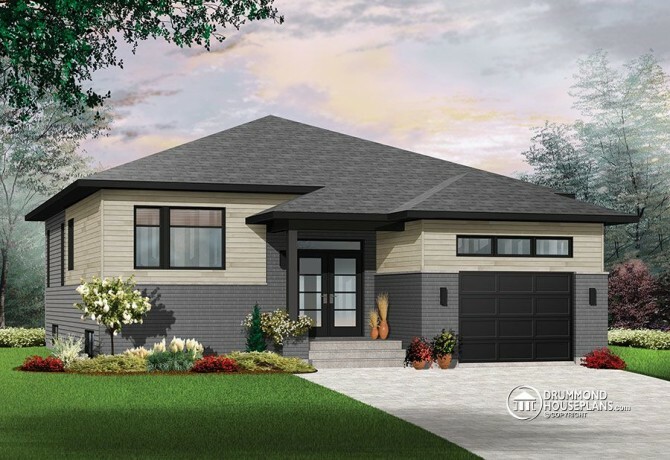 This contemporary with 9 ft ceilings has more than a modern style, it takes advantage of new trends in architectural design that includes a split level from the main foyer with direct access to the garage from inside the home. I’ll be back in touch with you when I’m ready to buy. Please let the designer know that I LOVE this house plan–it is the one I intend to build. It’s a very intelligent design: economical to build due to the square shape, private because the living area is to the back of the house, modern due to the layout, windows, and finishes. Everything I’ve been looking for!